Consensus is growing among scientists from a range of climate centres across the world that a weak El Niño is likely to occur during the coming northern hemisphere winter. The above diagram shows the temperature observations for the central region of the Pacific (in black) and the evolution predicted by the Met Office dynamical long-range ensemble forecast system (in red). Professor Adam Scaife is the head of long-term to decadal climate prediction at the Met Office Hadley Centre. Commenting on the expectations of an El Niño this winter, Professor Scaife said: “There is a range of forecasts, but the most likely scenario is for the development of a weak to moderate strength El Niño event. El Niño is the warm phase of the so-called El Niño Southern Oscillation (ENSO) – the largest natural fluctuation in the earth’s climate system – and it stretches along the equator across the Pacific Ocean. During more extreme El Niño events, such as the event beginning in late 2015, the surface ocean temperature rose almost 3.0 °C above the long-term average: the rise in temperature in this winter’s anticipated event is expected to be far less, around 0.5-1.0 °C above normal. 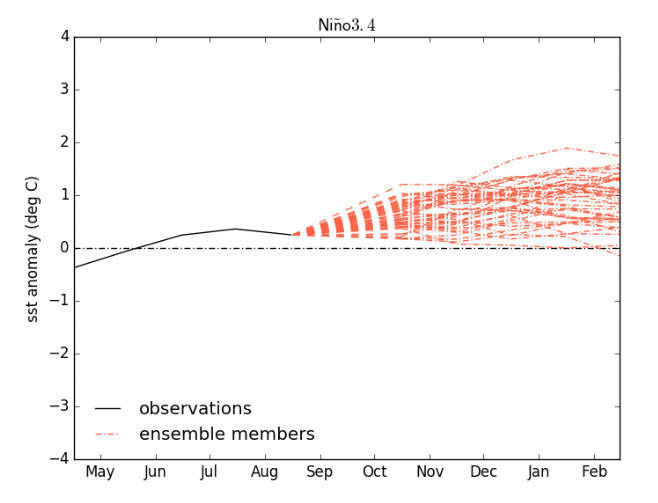 The phases of ENSO have influences on weather patterns in the Pacific basin. However, they also have an influence on global climate patterns, including those affecting north-west Europe. There has been some recent media speculation about how an El Niño may affect our weather over winter. Prof Scaife said: “Understanding the influence that the ENSO cycle can have on the world’s weather patterns is a useful tool for long-range weather forecasting, but it’s important to understand that it’s not the only factor which determines our weather here in the UK. “An El Niño can create wetter and windier conditions in the first half of winter and it can bring a colder and drier second half, but El Niño is just one factor and others will vie to affect our winter. For example, the Quasi-Biennial Oscillation (QBO) with its 14-month pattern of alternating easterly and westerly winds along the equator can weaken or strengthen the jet stream. This entry was posted in Met Office News and tagged climate science, El Niño-Southern Oscillation, El Nino, Met Office, Met Office Hadley Centre, Pacific Ocean, qbo. Bookmark the permalink.